It is a ritual in Canadian politics: a new government comes into power, it reviews the books, and then expresses outrage at how badly the finances were managed and how the public was misled. Conservative governments then use these shocking “discoveries” to double down on privatizing and reducing public services. Following that tradition, the new Ontario government recently appointed an Independent Financial Commission of Inquiry that included former B.C. Premier Gordon Campbell, former federal Deputy Minister of Finance Michael Horgan, and forensic accountant Al Rosen. 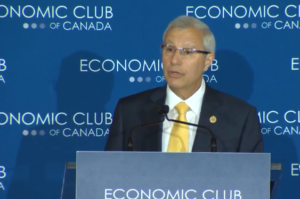 That report, released today, was showcased in Finance Minister Vic Fedeli’s highly partisan speech to the Economic Club of Canada revealing some of the conclusions from the commission’s report—most notably, the claim that Ontario’s deficit is actually $15 billion. In contrast to the strong tone in the minister’s speech, the report itself is actually quite measured. Two major issues that the commission’s report addresses have been well canvassed before: the treatment of some public pension plan assets and the financing of the Fair Hydro plan. The treatment of these issues had the previous government and the auditor general at loggerheads. The commission takes a measured approach with respect to the pension issue. The report states that the government and the auditor general need to get on the same page, which is hard to disagree with. Until then, it suggests that the government uses the auditor general’s numbers. By doing so, Ontario’s deficit goes up by $2.7 billion. With respect to the Fair Hydro plan, the commission agrees with the auditor general. And expert opinion is on its side on this one. The treatment was a financial sleight of hand trying to meet both deficit and hydro bill promises made by the previous government. That ratchets the provincial deficit up another $2.4 billion. The commission also agreed with the Financial Accountability Office that the previous government’s promise that program spending would grow by only two per cent a year would be hard to achieve. The commission also updated revenue and expenditure forecasts. It revised the revenue forecast down by a very modest $1.5 billion. Bottom line: increased costs from treatment of hydro ($2.4 billion), pension assets ($2.7 billion), and the reversal of program spending target ($1.4 billion) results in a total $6.4 billion increase in expenses. Overall, the report did not support the finance minister’s fiery, partisan rhetoric. This new government is clearly intent on setting up a frame that gives it room to make policy moves it never promised on the campaign trail. Count on the government to use this fiscal shortfall as a cover to cut spending even more than it initially promised during the campaign. With health and education spending accounting for more than 60 per cent of program spending in Ontario, we know that these cuts will have an impact on these crucial public services. Expect more wait times for hospitals and fewer nurses caring for us when we are sick. More delays in essential school repairs and a shortage of essentials crucial to kids’ education. And expect fewer supports for Ontario’s most vulnerable. It doesn’t have to be this way. Ontario’s new finance minister could have stood in front of the Economic Club of Canada, announced a bigger deficit than expected, and he could have taken the opportunity to tell corporate Ontario that we can’t afford more tax cuts. After all, Ontario’s obsession with tax cuts is partly responsible for its revenue problem. Sure, most new governments play this we found skeletons in the closet game. But fiscal conservatives use it as an opportunity to cut—and Fedeli’s presentation today suggests that this government is paving the way for cuts that will be fast and deep. • Got a problem? Privatize it (and pay the price for selling off Hydro One later). There is another issue never addressed anymore by CCPA. That is, “From whom does the government borrow?” In the early 90s under Bob Rae, COMER economists advised the Finance committee, chaired by my brother an MPP who taught economics, to use the POSO — The Province Of Ontario Savings Offfice — to finance the deficit during that recession. That idea was resisted by Laughren until the last year of their mandate. The Harris government then sold the POSO. If the CCPA wanted to increase its credibility on these issues it would look at other public banking options around the world such as North Dakota, Germany and China not to mention the Guernsey Islands. Or even examine Canada’s history using the Bank Of Canada and articles published by the Levy Institute. A good beginning resource is Ellen Brown in her book the Public Banking Solution or even Richard Werner’s presentations on Germany. The COMER archives — comer.org — are packed with information too. In the USA the city of Los Angeles is having a referendum on the Public Banking issue and the governor of New Jersey has an interest in the issue. Alberta has its public bank called the Alberta Treasury Board but does/cannot use it for financing government services but only private entrepreneurial activities it seems. The problem seems to be the Libertarian beliefs that governments should be shrunk and not used to help people. In Canada all MPs appear to have signed on to the Austrian school of Economics belief that the Bank of Canada should be autonomous and only deal with inflation and the government should only look at fiscal budgetary measures. As I have frequently pointed out, the fiscal situation of the government is impacted on and by the monetary policies and actions of the Bank Of Canada which also impacts on the fiscal situation of the provinces and municipalities. We will continue to face these problems until we change our thinking about public banking.